We have been contacted by people in Ireland, England, and Colorado who are doing genealogical searches on their family name "Uniacke". We have been contacted by people in Ontario who grew up here in the early to mid- 1900's and moved away. We have been contacted by still other people who had relatives who lived here and who grew up with stories of the Mount Uniacke Gold Mines. Earlier this month, our web site brought still another "former resident" of Mount Uniacke back into our lives. We have been contacted by Ronald Mizon (who just acquired a computer with access to the web) who was here in 1941/1943. 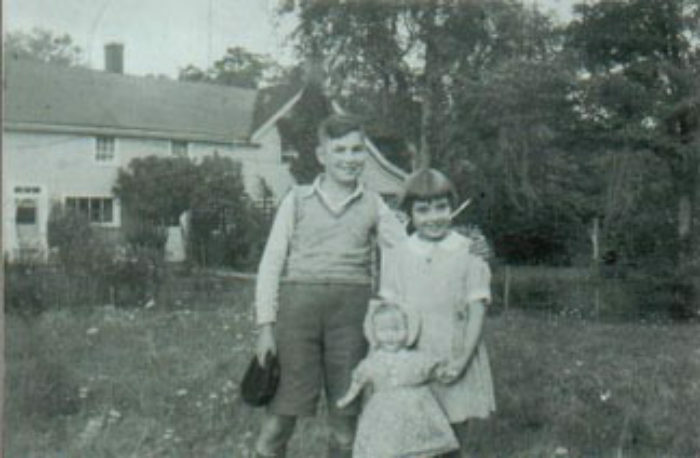 Photo taken in front of George and Allie Cole's house the same day they arrived in Uniacke from Halifax NS (and the UK) (Mount Uniacke, 1940). 65: FROM HMCS WARRIOR TO HMS VICTORY (AGAIN)! 10: TREES, TREES AND YET EVEN MORE TREES!